MOORESVILLE, N.C. - Lucas Oil announced today that its longtime relationship with Pat Musi Racing Engines and Musi Racing will continue for the 2019 season on a number of different fronts. Lucas Oil will share the primary sponsorship with Edelbrock on Frank Brandao's record-setting Pro Nitrous 2018 Dodge Dart driven by standout driver Lizzy Musi, while the partnership will also extend into the engine shop for Pat Musi Racing Engines. The company has proudly used Lucas Oil's proven products for more than a decade with an impressive track record. "Lucas Oil is extremely proud to return in 2019 with Musi Racing and driver Lizzy Musi," Lucas Oil Motorsports Manager Tom Bogner said. "We're always looking for partners that can help us bring awareness to our products, and we enjoy working with Pat and the entire Musi family. Lizzy is a very talented driver who has already put together a number of exciting records using Lucas Oil products, and I'm looking forward to seeing the results on the dyno and on the track in 2019. We also like the strong connection with Edelbrock on her Dodge Dart and in Pat's engine shop, putting us alongside another strong American performance aftermarket company." On the dragstrip, Lizzy Musi will race the full 2019 Professional Drag Racers Association (PDRA) season, which starts in April at GALOT Motorsports Park in Benson, NC, as well as the Mad Mule events that take place at GALOT and Virginia Motorsports Park in Dinwiddie, VA. Musi has compiled a list of jaw-dropping performances and numerous race victories in her young career, and is also the fastest driver in eighth-mile doorslammer nitrous racing after posting an incredible 209.23 MPH pass at the 2018 PDRA World Finals at VMP. At Pat Musi's highly-successful engine shop, Lucas Oil is the lifeblood for every Musi engine. 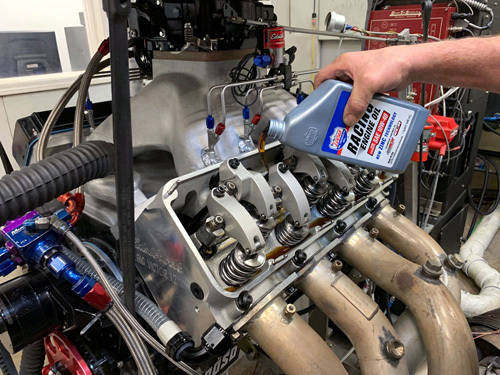 That will continue in 2019, as Pat Musi Racing Engines will use Lucas Oil's 10w40 Racing Oil, 20w50 Racing Oil, 20w50 Break-in Oil and the new Low Viscosity Stabilizer this year to again stay a step ahead of the competition. "I couldn't be more excited to continue our relationship with Lucas Oil. Tom and the team are like family to us at this point," Pat Musi said. "Their support, both with their sponsorship on the track and their quality oils in the engine room, has been invaluable in allowing us to achieve our sustained success and 2019 should be no different."